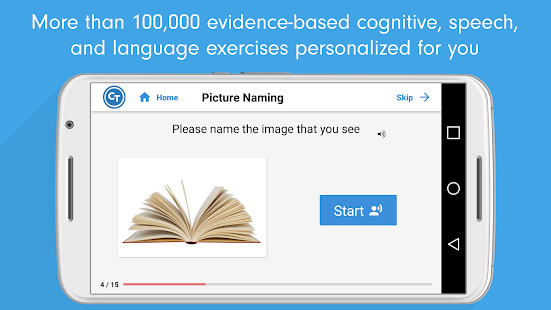 The Constant Therapy app is a virtual clinic, leading users through a digital door toward more than 100,000 speech, language and cognitive exercises. 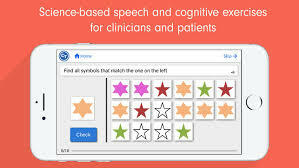 Created by the Learning Corp and built by an expert team of neuroscientists and clinicians at Boston University, this award-winning app was developed with the goal of helping people with learning disabilities or those recovering from traumatic brain injury, stroke or aphasia. Constant Therapy includes 50 categories of tasks with varying degrees of difficulty. It automatically assigns tasks to users based on their initial evaluation and performance history. Exercises range from spelling, rhyming and sentence completion to picture matching, map reading, multiplication and much more. The app’s library of therapy resources is continually updated and constantly growing. 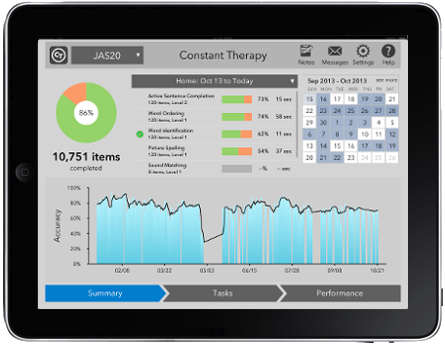 Not only does this app enable users to engage in therapy from the comfort of their home, but it also allows clinicians to track their progress and pinpoint areas in need of improvement. Through advanced analytics, they can see exactly where their patients are on the road to recovery. This data also encourages users by clearly showing them the positive leaps they are taking. If you or a loved one could benefit from the Constant Therapy app, visit https://www.constanttherapy.com for more information. Purpose: To assess the inter-rater reliability and concurrent validity of the Communication Evaluation in Rehabilitation Tool, which aims to externally assess physiotherapists competency in using Self-Determination Theory-based communication strategies in practice. Materials and methods: Audio recordings of initial consultations between 24 physiotherapists and 24 patients with chronic low back pain in four hospitals in Ireland were obtained as part of a larger randomised controlled trial. Three raters, all of whom had Ph.Ds in psychology and expertise in motivation and physical activity, independently listened to the 24 audio recordings and completed the 18-item Communication Evaluation in Rehabilitation Tool. Inter-rater reliability between all three raters was assessed using intraclass correlation coefficients. Concurrent validity was assessed using Pearson’s r correlations with a reference standard, the Health Care Climate Questionnaire. Results: The total score for the Communication Evaluation in Rehabilitation Tool is an average of all 18 items. Total scores demonstrated good inter-rater reliability (Intraclass Correlation Coefficient (ICC) = 0.8) and concurrent validity with the Health Care Climate Questionnaire total score (range: r = 0.7–0.88). Item-level scores of the Communication Evaluation in Rehabilitation Tool identified five items that need improvement. Conclusion: Results provide preliminary evidence to support future use and testing of the Communication Evaluation in Rehabilitation Tool. Promoting patient autonomy is a learned skill and while interventions exist to train clinicians in these skills there are no tools to assess how well clinicians use these skills when interacting with a patient. The lack of robust assessment has severe implications regarding both the fidelity of clinician training packages and resulting outcomes for promoting patient autonomy. This study has developed a novel measurement tool Communication Evaluation in Rehabilitation Tool and a comprehensive user manual to assess how well health care providers use autonomy-supportive communication strategies in real world-clinical settings. This tool has demonstrated good inter-rater reliability and concurrent validity in its initial testing phase. The Communication Evaluation in Rehabilitation Tool can be used in future studies to assess autonomy-supportive communication and undergo further measurement property testing as per our recommendations. Objectives: To characterize Internet and social media use among adults with moderate to severe traumatic brain injury (TBI) and to compare demographic and socioeconomic factors associated with Internet use between those with and without TBI. Setting: Ten Traumatic Brain Injury Model Systems centers. Participants: Persons with moderate to severe TBI (N = 337) enrolled in the TBI Model Systems National Database and eligible for follow-up from April 1, 2014, to March 31, 2015. Design: Prospective cross-sectional observational cohort study. Main Measures: Internet usage survey. Results: The proportion of Internet users with TBI was high (74%) but significantly lower than those in the general population (84%). Smartphones were the most prevalent means of Internet access for persons with TBI. The majority of Internet users with TBI had a profile account on a social networking site (79%), with more than half of the sample reporting multiplatform use of 2 or more social networking sites. Conclusion: Despite the prevalence of Internet use among persons with TBI, technological disparities remain in comparison with the general population. The extent of social media use among persons with TBI demonstrates the potential of these platforms for social engagement and other purposes. However, further research examining the quality of online activities and identifying potential risk factors of problematic use is recommended. People with disabilities may encounter obstacles to keeping up with these social trends and enjoying their advantages. A Pew survey5 in 2011 revealed that Americans with disabilities are less likely to use the Internet than their able-bodied counterparts (54% vs 81%). This remained true even after controlling for factors such as lower income, lower education, and older age. Moreover, people with disabilities were less likely to use online access methods such as broadband service and mobile devices, both of which are advantageous for seeking work, finding health information, and communicating remotely with others. Lack of experience with these technologies creates a vicious cycle, as less experience predicts less favorable outcome in studies using Web-based platforms to help mitigate the effects of disability.6 All of these trends are unfortunate, considering that the Internet and social media may be seen as electronic curb cuts7—resources to help offset the reduced mobility and social isolation that affect many people with disabilities. Reduced social network size and loneliness are particularly common for persons with traumatic brain injury (TBI).8–11 Social networking through the Internet has the potential to alleviate this isolation. However, cognitive impairments typical after TBI9 , 11 (eg, impaired memory, attention, and organization) may pose an obstacle to learning and utilizing rapidly changing technology. There have been recent studies exploring the use of mobile technology to help people with acquired brain injury compensate for cognitive impairments12–14 and caregivers for such individuals to utilize online resources for support.15 , 16 A few studies have attempted to directly teach Internet access17 or use of social media18 to people with TBI. Others have surveyed people with TBI on their habitual use of the Internet19 or Facebook.20 Such studies quickly become outdated and difficult to generalize as new technologies and online trends emerge. As a result, there is an ongoing need for updated information regarding the use of online technology after TBI that can guide future efforts to narrow the “disability divide,”21 encourage Internet-based social participation, and develop online interventions to facilitate these novel forms of interaction. After traumatic brain injury, many couples find that their relationship with each other changes dramatically. These changes are very personal and can be very emotional for both people in the relationship. This factsheet will help couples understand some of the common changes they may notice in their relationship after TBI. Also, suggestions are given for ways that couples can address some of the more difficult changes they are experiencing. Although some of the relationship changes after TBI are difficult and can be painful, there are many things that couples can do in order to enjoy each other and their relationship in new, positive, and meaningful ways. The intimate partners of survivors may have new concerns or fears related to both the incident that caused the injury and the new behavior traits of the survivor. Also, partners often change the focus in their lives in order to manage the multiple challenges that arise for their family after an injury. These changes in the survivor’s personality and the life focus of both partners often result in a feeling that partners do not know what to expect from one another. Uncertainty can increase stress and anxiety within the home. How Are Relationships Typically Affected? After a TBI, survivors must focus their energy on getting better and developing new skills. As a result, the assignment of responsibilities in the home must change. This means that everyone in the family is involved in learning new skills and taking on new jobs. How do responsibilities typically change? Survivors often give up many responsibilities, including work expectations and household chores, while they focus on getting better. There are also new tasks for both survivors and their partners, such as managing the health care of the survivor. What happens when responsibilities change? Any time people have to take on new responsibilities and learn how to handle new tasks, they will also experience more stress. In addition to the stress of injury and recovery, the stress of changes in responsibilities can increase tension between partners. Partners who have significantly more responsibilities will also have less time for other things. In contrast, survivors who are focusing on getting better may feel like they have more time. This can result in different expectations about how much time partners have to spend together. Be understanding about each other’s new responsibilities. This can have a positive impact on a relationship. Although it is natural to focus on oneself when a person is overwhelmed, partners must take time and effort to note all of the new responsibilities their partner is managing. Noticing and talking about these challenges can reduce tension within your relationship. Say “thank you.” Make a commitment to yourself to thank your partner at least once a day for attempting to manage new responsibilities. Schedule opportunities to take breaks from responsibility. These breaks may be short and may not be as frequent as desired. However, when couples and families schedule time off for each adult family member and honor that commitment both practically and emotionally, thankfulness and respect are more likely to grow in the relationship. In all families, people take on roles that often define how they behave. After brain injury, the challenge of recovery nearly always results in some changes to the roles within a family. While the person with TBI is in the hospital, their partner may need to make decisions that are usually made by the survivor. For example, a husband may make decisions about child care that his wife usually makes, or a wife may calm the family when everyone is upset, although that is something her husband has always done. How do relationship roles change? Although people often take on many different roles in their relationships over the course of a lifetime, TBI results in dramatic role changes that occur instantly, and without preparation. Early on in recovery, it may seem to couples that role changes are temporary. However, as time progresses, couples often find that these role changes may last for years or even be permanent. Commonly, partners take on more leadership roles in the relationship. Depending upon who is hurt and how the family did things before the injury, this may mean some small shifts for the couple, or it may mean drastic changes. What happens when relationship roles change? The more role changes that occur, and the more dramatic the changes are, the harder it may be for a couple to adjust to the changes. Couples who keep tasks separate instead of alternating who does what may find it more challenging to adjust to new roles. Couples who have just recently begun a new phase of their relationship, such as being newly married, having children, or being a new “empty nest” couple, may have a more difficult time with changes in roles. As each partner learns how to operate in his or her new role, there will be a period of adjustment for both people. Uncertainty and frustration during this time can result in increased criticism between partners. People close to the couple may not understand the need for role changes and sometimes incorrectly believe that such changes slow recovery. For example, family members may say “Let her talk to the kids’ teachers. She will never get back to her old self if you don’t let her do her job.” This can cause tension between the couple and their family and/or friends. Identify where role changes occur and talk about these changes openly. Partners should try to be sensitive to the feelings of survivors. For example, the survivor may have felt pride in his or her role before the TBI and may feel sad or frustrated when asked to step aside. Partners can serve as mentors and consultants for one another. Couples can ask one another, “What works best for you when you are in this situation?” Although survivors may not be able to manage a former role, such as being the financial decision maker, they can share their knowledge with their spouse. Both partners will benefit when this approach is taken. Couples must be conscious of not criticizing the partner who is taking on a new role. For example, it is unlikely that a girlfriend will handle a challenge in the same way her boyfriend would have handled it. Partners should work hard to support one another in their new roles. This includes being patient with the time it takes for everyone to feel comfortable in their new roles. Family and friends may need to be taught about brain injury and the changes it brings. Children who live at home will also benefit from direct discussions about these changes: “I know mom used to be the person who checked your homework every day, but she and I have decided that it will be better for now if I do it.” Without open communication about role changes, others may not understand why things feel so different and why supporting those differences can help the whole family to heal. Communication is the foundation of a relationship. Many people think only of talking when they hear the word “communication,” but couples are actually communicating through gestures, facial expressions, emotional reactions, and physical interactions as well. In studies on relationships after brain injury, communication is often reported as the biggest change people notice. Additional responsibilities and the uncertainty of recovery can cause spouses to feel very overwhelmed. When overwhelmed, people often change their communication styles. Some common changes can include talking less, talking more, and/or communicating more intensely or urgently than before. Spouses may be unsure how best to communicate with their partner after injury. This discomfort may cause spouses not to communicate as often or as openly with the survivor. Increased stress levels often affect communication for both partners. Both people may be afraid that sharing their negative thoughts or feelings will burden their partner. When either person in a relationship changes how he or she communicates, both people will behave differently. What happens when communication styles and patterns change? Changes in communication between partners can result in both people feeling alone and isolated. Couples may feel they no longer understand what their partner is thinking or feeling. Difficulty communicating can sometimes cause people to pull away from their relationship, choosing instead to handle challenges with friends or other family members. Sometimes, people choose not to communicate their feelings with anyone at all. Communication struggles can impact all other parts of a relationship, including responsibilities and roles, and make it difficult to adjust to changes together. Both partners should make a commitment to improve communication. Listen patiently to what your partner is saying. Listen for points where you can agree rather than focusing on disagreement. When you do disagree, think about what you might say before you say it. Remember that survivors will likely need more time to think about what their partner is saying, or about how they want to communicate again, patience is key. Take notes on your thoughts during conversations rather than immediately saying what comes to mind. Come back to these points later, after you have had time to reflect. Exchange bulleted lists of important points for big discussions. When you have something you would like to say, write it down before a discussion and use it as a guide. Trading these lists after a conversation helps with memory and allows more time to digest and think about the information. When a topic is likely to cause a disagreement, practice what you would like to say before you start the conversation. Practice in front of a mirror. Look at facial expressions, gestures, and body language, while also choosing your words carefully. When you talk, try to stick to what you practiced. Therapy can give couples support and ideas to improve their specific situations. Different types of counseling are available, including individual counseling for either the survivor or partner, couples counseling, or family therapy. Seek out a counselor or psychotherapist who has expertise in brain injuries. If there are no therapists locally with brain injury experience, couples should provide their therapist with information about injury and common relationship challenges that can accompany injury. The Web sites on this factsheet can be a good place to start. Many communities have support groups for both survivors and caregivers/partners, which are often listed in the newspaper or advertised by State brain injury associations. These groups can help couples establish new friendships, find local information and resources, and provide time apart from their partner for reflection. When local support groups are unavailable, try Web-based chat groups and support communities. These groups are an excellent option when in-person groups are either too far away or when transportation is a challenge. To find a support group or counselor in your area, start with your State brain injury association. If you do not know how to reach your State brain injury association, you can either a) contact the Brain Injury Association of America (1–800–444–6443 or on the Web at http://www.biausa.org or b) use an online search engine (Google, Yahoo, Bing, etc.) to find one by typing in “Brain Injury Association” and the name of your state. Online support groups are available on Facebook and throughout the Web. Use the search feature on Facebook and type “Traumatic Brain Injury” to find different groups that you may like. Or use an online search engine such as Google or Yahoo and search the term “Traumatic Brain Injury Support Groups.” There are many different options, so look around to find the one that best fits your needs. At home, make a commitment to establish a positive environment. Looking for progress in recovery instead of ways in which a relationship is not succeeding can improve how people feel about each other. Additionally, part of having a positive home life comes from the opportunity for fun as a couple. Scheduling a “date” on the calendar to take a walk, watch a movie on television, or play a game like cards can be an inexpensive strategy that may make a big difference in reducing tension. When fun time is scheduled, consider it to be as important as a doctor’s appointment—something that cannot be ignored or rescheduled. Any couples who are new to their relationships can work to take a positive approach to recovery. Although role uncertainty may be a challenge, it also provides the couple more freedom by not being tied to old ways of doing things. There are also a growing number of adults who choose to live in unmarried monogamous relationships. For cultural, financial, social, or other reasons, these couples may not be in a “traditional marriage.” Individuals who identify as gay, bisexual, lesbian, or transgender, as well as people who identify as heterosexual and in an unmarried relationship may have more complicated issues to deal with. For example, they may not have access to their unmarried partner’s insurance, bereavement, pension, or other benefits. Other challenges can include the inability to be represented in health care decisions, lack of recognized family leave from work, or even having to choose to “come out” as a result of the injury. In addition, the lack of acceptance or awareness in their community with regard to nontraditional relationships may impact a couple’s ability even to seek or obtain care. These complications can influence a couple’s success or failure in a relationship. For caregiving partners, building relationships with the survivor’s family members who are supportive can be very helpful. Partners may want to make working on these relationships a top priority as a way to stay involved in a survivor’s care. Psychotherapy or counseling is likely an important component of recovery for nontraditional couples. Because partners may have even less support than couples in traditional relationships, finding a therapist who can provide this support and guidance is an important part of healing. You may have heard that divorce or separation is likely after TBI. Although no one knows for sure what will happen in any relationship, some studies suggest that divorce and separation rates may actually be lower after brain injury than for the rest of the population. Rather than focusing on the possibility of divorce or separation, couples do best by focusing on improving the quality of their relationship with one another. Healing Your Marriage After Brain Injury. Published in “The Challenge,” a Brain Injury Association of America publication. Written by Jeffrey S. Kreutzer, Ph.D., and Emilie E. Godwin, Ph.D.
Couples’ Relationships After Traumatic Brain Injury was developed by Emilie Godwin, PhD, Jeffrey Kreutzer, PhD, and Stephanie Kolakowsky-Hayner, PhD in collaboration with the Model System Knowledge Translation Center. This health information content is based on research evidence and approved by experts from the TBI Model Systems. The brain injury experience is a very complex experience. Overnight, so many things change and so many adjustments need to made. Throughout this experience, brain injury survivors have goals, concerns and aspirations. Loved ones also have their own goals, concerns and aspirations which may or may not be the same as those of the survivors. The survivors and their loved ones try their best to achieve hoped-for outcomes. Sometimes, these differences in desired outcomes lead to conflicts. One of the underlying reasons for these conflicts is poor communication. A good place to start open communication is to have a family meeting in which goals, concerns and aspirations are talked about. The meeting should be planned in advance with all parties informed of the purpose of the meeting. This gives each family member time to organize their thoughts about these issues. Many survivors benefit from writing a list of topics they want to discuss at the meeting to help them avoid forgetting about a topic. A meeting of this sort does not need to be the final word on any topic. In fact, it is good to say from the start that everyone at the meeting may not (and perhaps are likely to not) agree with what others are saying. Particularly at the first meeting of this sort, it is not important to make decisions regarding the future. Instead it is more important to open the lines of communication so each person can know what the other is thinking and “mind reading” can be avoided. Opening the lines of communication in such a formal manner may seem awkward to some but it helps ensure that an actual discussion of the goals, concerns and aspirations of each family member will actually be discussed rather than devolving into other conversations. Once these lines of communication are opened and everyone has a chance to openly discuss their thoughts, it is much easier in the future to re-visit these topics in a fully open manner. Open communication can ultimately allow family members to walk hand-in-hand into the future with less conflict. Guidelines in stroke rehabilitation recommend the use of a multidisciplinary approach. Different approaches and techniques with music are used in the stroke rehabilitation to improve motor and cognitive functions but also psychological outcomes. In this randomized controlled pilot trial, relational active music therapy approaches were tested in the post-acute phase of disease. Thirty-eight hospitalized patients with ischemic and hemorrhagic stroke were recruited and allocated in two groups. The experimental group underwent the standard of care (physiotherapy and occupational therapy daily sessions) and relational active music therapy treatments. The control group underwent the standard of care only. Motor functions and psychological aspects were assessed before and after treatments. Music therapy process was also evaluated using a specific rating scale. All groups showed a positive trend in quality of life, functional and disability levels, and gross mobility. The experimental group showed a decrease of anxiety and, in particular, of depression (p = 0.016). In addition, the strength of non-dominant hand (grip) significantly increased in the experimental group (p = 0.041). Music therapy assessment showed a significant improvement over time of non-verbal and sonorous-music relationships. Future studies, including a greater number of patients and follow-up evaluations, are needed to confirm promising results of this study. Traumatic brain injury most often is the result of severe external force against the head. The force is violent enough to cause brain dysfunction and disrupt necessary brain and bodily functions. When a traumatic brain injury occurs, according to the National Institutes of Health, several brain functions are disrupted causing various degrees of damage from mild to permanent. Traumatic brain injury can be caused by blunt force trauma or by an object piercing the brain tissue. Symptoms may be mild and temporary, moderate, or severe. Often, the injury requires brain surgery to remove ruptured blood vessels or bruised brain tissue. Disabilities may arise depending on the extent of damage from the traumatic brain injury. [Abstract] Interfacing brain with computer to improve communication and rehabilitation after brain damage. Communication and control of the external environment can be provided via brain–computer interfaces (BCIs) to replace a lost function in persons with severe diseases and little or no chance of recovery of motor abilities (ie, amyotrophic lateral sclerosis, brainstem stroke). BCIs allow to intentionally modulate brain activity, to train specific brain functions, and to control prosthetic devices, and thus, this technology can also improve the outcome of rehabilitation programs in persons who have suffered from a central nervous system injury (ie, stroke leading to motor or cognitive impairment). Overall, the BCI researcher is challenged to interact with people with severe disabilities and professionals in the field of neurorehabilitation. This implies a deep understanding of the disabled condition on the one hand, and it requires extensive knowledge on the physiology and function of the human brain on the other. For these reasons, a multidisciplinary approach and the continuous involvement of BCI users in the design, development, and testing of new systems are desirable. 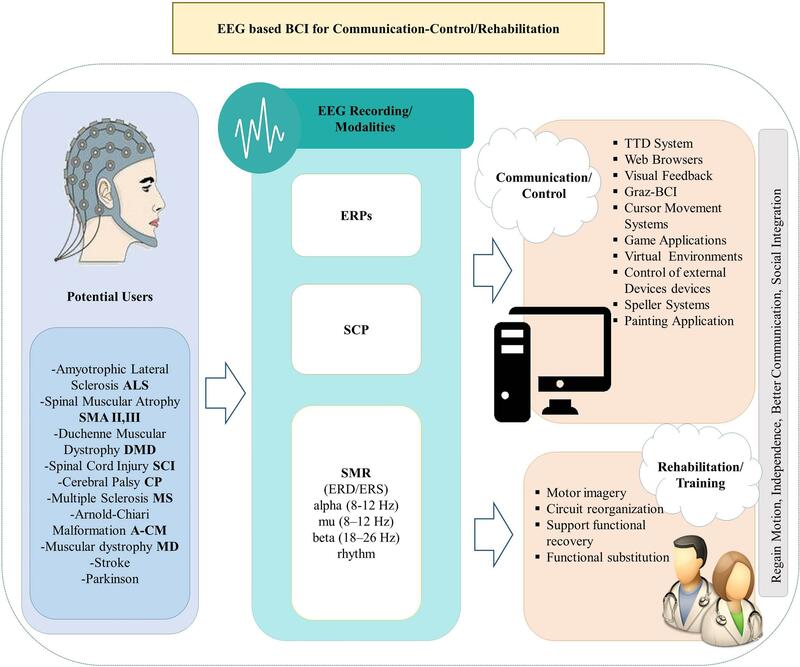 In this chapter, we will focus on noninvasive EEG-based systems and their clinical applications, highlighting crucial issues to foster BCI translation outside laboratories to eventually become a technology usable in real-life realm.